Alder Hey Children’s Charity say a big thank you! When tasked to ‘make a difference’, students on Reaseheath College’s Level 3 Diploma in Public Services course chose to bring joy to children whose illnesses kept them in hospital over Christmas. They focused on helping young patients at Alder Hey Children’s Hospital in Liverpool, one of the country’s leading specialist hospitals, and donated well over £300 worth of Christmas presents. A committee, elected by course members, organised the whole activity including contacting the hospital, communicating with relevant departments, advertising their campaign, collecting donations and adding presents themselves. They then organised a visit to the hospital to deliver the gifts. After receiving the gifts, Alder Hey Children’s Charity Director Clare Wright wrote to the college to say thank you to students and staff. http://reaseheathblog.org/public-services/wp-content/uploads/sites/16/2015/12/Public-services-christmas-1-mb.jpg 1281 1281 reaseheathblog http://reaseheathblog.org/public-services/wp-content/uploads/sites/16/2017/05/reaseheath-logo-web-header.png reaseheathblog2016-01-18 10:49:532017-05-23 16:12:58Alder Hey Children’s Charity say a big thank you! When tasked to ‘make a difference’, students on Reaseheath College’s Level 3 Diploma in Public Services course chose to bring joy to children whose illnesses will keep them in hospital over Christmas. 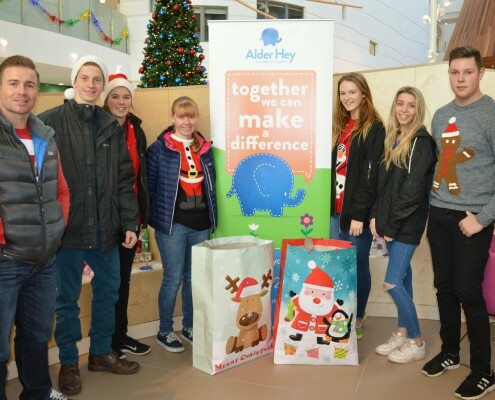 They focussed on helping young patients at Alder Hey Children’s Hospital in Liverpool, one of the country’s leading specialist hospitals, and donated well over £300 worth of Christmas presents. A committee, elected by course members, organised the whole activity including contacting the hospital, communicating with relevant departments, advertising their campaign, collecting donations and adding presents themselves. They then organised a visit to the hospital to deliver the gifts. Said Course Manager Liam Salt: “I’m extremely proud of all the students and how much they achieved with minimal input from me or other lecturers. They are a credit to their course, to the public services department and to Reaseheath College.